This paper explores the system of categories that is used to classify articles in Wikipedia. It is compared to collaborative tagging systems like del.icio.us and to hierarchical classification like the Dewey Decimal Classification (DDC). Specifics and commonalities of these systems of subject indexing are exposed. 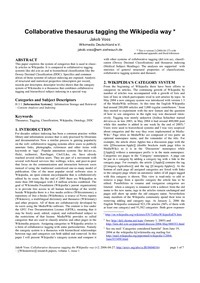 Analysis of structural and statistical properties (descriptors per record, records per descriptor, descriptor levels) shows that the category system of Wikimedia is a thesaurus that combines collaborative tagging and hierarchical subject indexing in a special way.